Thank You For Visiting St. Judy Disc Golf! My name is James Francis, and I’m an avid disc golf player ever since I was introduced to the sport by my brother in 2008. I fell in love with the sport because of the laid back & casual attitude, the ability to enjoy the great outdoors, and the technique needed to master the sport. I’m a right handed player, and when I first started playing I only threw forehanded. But after playing more and more I found that I could get more distance and consistency out of my back hand. As mentioned earlier, I started playing disc golf around 2008, and although it started as a minor hobby, I soon became addicted and couldn’t play enough! After finding a good group of friends that enjoyed playing as well, I soon found myself playing at least 3 or 4 times a week. As I began to play more I often looked at Youtube videos to help improve my technique and look at various types of throws. As I began to get better, I began to play in a few tournaments around my hometown, and started playing more competitively. I soon began playing in a few PDGA events around the Southeast United States, and I got to play with and against the best of the best! Although I still enjoy playing, with a wife and a child on the way, I haven’t been able to practice as much as I should if I wanted to keep playing at a professional level. Because of this, I decided to stop playing in PDGA events, and only play in the occasional local event. After reflecting over my disc golf career, I began to think about just how much disc golf has given me. I’ve gained numerous life long friends playing disc golf, I met my wife playing disc golf, I was able to travel the country playing disc golf, and I knew that this sport could do so much more to influence lives. In 2016 I began supporting a disc golf charity event, called the St. Jude Disc Golf Charity Event to help provide monetary support for St. Jude Children Research Hospital. We are approaching our 3rd annual disc golf tournament, with all the proceeds going to St. Jude. Although setting up this charity event has been a lot of work every year, it is worth it after seeing the outpouring support for the event, and all the lives we’ve been able to change! You can view the page of our 2018 event here. Stay tuned for more details about the 2019 event! 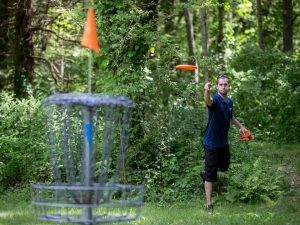 As mentioned prior, the main objective of StJudeDiscGolf.com is to provide information about the annual disc golf charity event. That being said, because I have this platform, I also wanted to create a disc golf blog that I would have appreciated when I was a beginner, and also as a veteran. In this blog I will be doing countless product reviews which will help give you an unbiased opinion on which disc golf products are beneficial, and which aren’t worth the money. Along with this, a big focus will be on picking the best discs for your play style and your experience. Furthermore, I’ll also be creating blog posts, and tutorial videos on various throwing techniques and tips and tricks to improve your game. Along with this, I’d love to hear from you guys on anything you need help with or any products you want reviewed!